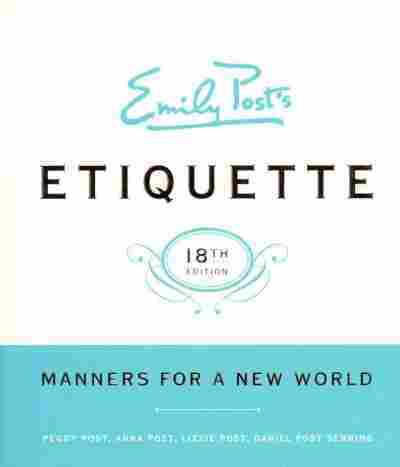 A New Emily Post For Your Blog Posts The great-great-grandchildren of Emily Post have come out with a new edition of Etiquette that takes on internet manners. But will you use it? Do we care about manners? We certainly seem to care a lot about Downton Abbey, but perhaps that is because the world of footmen, retiring to a drawing room and eating with tiny forks feels so very foreign to us in this mad dash era of texting and Twitter. I notice that more and more, my phone has ceased to be a real instrument for calling anyone (besides my parents and doctor's office) — if someone needs something from me, they quickly text, e-mail, or Skype. A thank you is extra, perfunctory. The downside of lightning-speed communication is that all conversations have the danger of becoming casually transactional, and far from formal or polite (do I sound like a grandmother yet?). And yet, there is one bastion of manners that shines on through the decades, doggedly determined to be the the bible of how to treat other people. Emily Post's Etiquette, which comes out today in its 18th edition and weighs as much as a country ham, has been the go-to guide for the prim and proper since its debut in 1922. Back then, the book was titled Etiquette in Society, In Business, In Politics, And At Home, and was penned by Emily herself, a 50-year-old divorcee living in an elegant Manhattan apartment on Washington Square. Today, the book is written by her great-great-grandchildren: Anna Post, Lizzie Post, and Daniel Post Senning, led by great-grandaughter-in-law Peggy Post. Together, they run the Emily Post Institute, a family business devoted to helping people avoid awkward faux pas at baby showers or funerals. The book contains all the classics — what it means to order frog legs, the right flowers to send to a hospital, how to perform a shady secret exit at a party without offending anyone — but it also tackles a new territory not exactly known for dignity or correctness: the internet. The 18th edition's tagline promises "Manners for a New World," which means that the authors have (adorably) adopted the internet and folded guidelines for online decorum into the massive tome on place settings and how to talk about current affairs at a cocktail party. Whether or not the web-based generation would ever use a book like this as a reference rather than a doorstop is the big question: We still need to know how to comport ourselves, perhaps now more than ever as we gain new forms of communicating and need authorities to navigate us through murky waters. But the book itself feels like a dusty artifact; what we really could use is an app for that. And as it turns out, one exists. Still, if you are a civility junkie, or just looking for a new coffee table amusement, the 18th edition does contain some gems and is worth flipping through. We present to you, without further ado, the most useful online advice from the "New World" of manners. 1) A red light on someone's GChat should be taken seriously: "Just because someone's IM service shoes them as being 'available,' doesn't necessarily mean they are...Respect 'do not disturb; status. Remember, each time you IM you are interrupting someone." Preach it, Emily. There is nothing more aggravating than someone trying to have an urgent instant message conversation when you are in the middle of a task. That said, we have learned the power of going "invisible" on GChat. 2) Easy on the caps lock: "Avoid typing your entire message in capital letters because CAPS ARE THE EQUIVALENT OF SHOUTING. So use upper- and lower-case letters unless you have something to shout about: I'M ENGAGED! All caps messages are also much harder to read." This is a good one — the trend of throwing down the caps-lock FOR EMPHASIS has run its course. Just capitalize the right words. And as for the woman who is shouting about being engaged: Emily Post says it's okay to delete her e-mail. 3) When you accidentally CC the wrong person on an e-mail, apologize right away: "Admit your insensitivity and tell her how terrible you feel about hurting her. As for for forgiveness, but don't expect the friendship to be patched up overnight, it might take months before she can trust you again. In the meantime, remind yourself of one of the edicts of email culture: You can never be too careful." We have done this one too many times to ignore the "always double check who you are actually sending this to" rule with email. Otherwise, you run the risk of inviting your ex-boyfriend's new girlfriend to your birthday party. Trust. 4) You are allowed to do whatever you want on your own Facebook page: "It's your page. It's okay to ignore a friend request, untag yourself from a photo or ask someone to remove a photo of you from their page, delete a friend's comment on your post, unfriend someone whose presence on your page makes you uncomfortable, ignore quizzes, groups, and event requests." This is true, and we thank Ms. Post's great-grandkids for saying something. People can be very touchy about Facebook and untagging, but the truth is, Facebook is how you present yourself to the world these days. You want your page to look exactly like a business card (or for some people, a postcard from a wild vacation in Cabo), and you are allowed to delete any content that does not belong. We all have to protect our reps.
5) The Post stance on Twitter = Don't Be Annoying: "Be relevant. Don't tweet about what you had for breakfast or what store you happen to be in...Beware of linking Twitter through your Facebook page. Your multiple tweets work on Twitter but may be annoying to people who get feeds from you through Facebook." Because there is nothing worse than hearing that you had waffles twice. So what do you think? Will you be using Etiquette to clean up your manners on the web, or will you continue to post snarky anonymous comments and send people "Let Me Google That For You" missives?